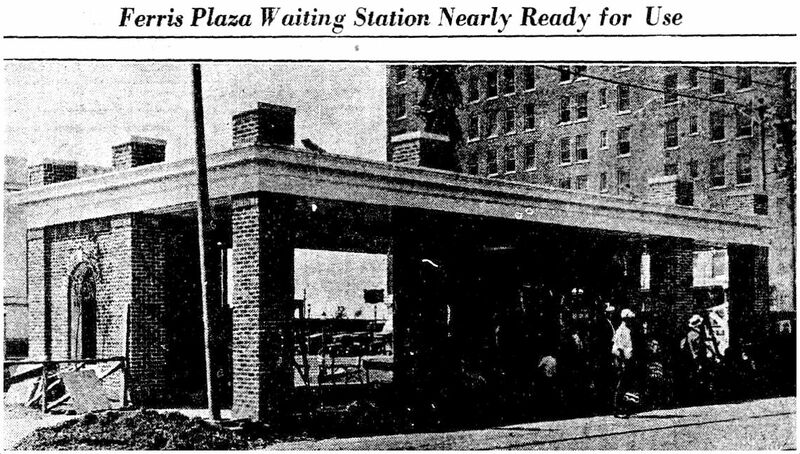 The “waiting station” was the brainchild of the Dallas Junior Chamber of Commerce which proposed the idea to the City of Dallas and, as it was to be built at the edge of a city park, the Park Board. The small (50 x 30) brick building — designed by Dallas architect J. A. Pitzinger — would cost $5,000 and would be paid for by funding from local businesses, including various transportation concerns (namely, the Northern Texas Traction Company). The “traction” companies would staff the information booth and sell tickets. The plans were accepted and permission was granted. 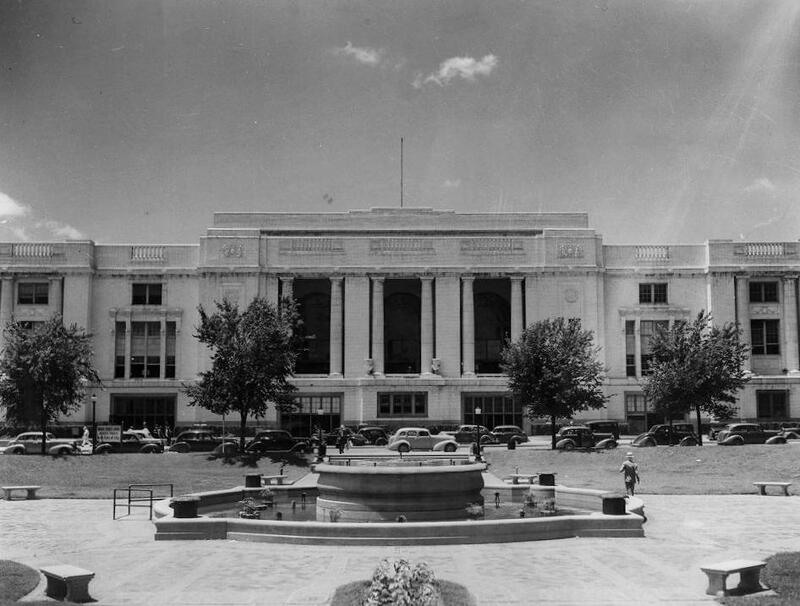 Construction began in July, 1925, and the building was opened for waiting by October. People would just have to wait somewhere else. Top photo from The Electric Railway Journal, Nov. 6, 1926. 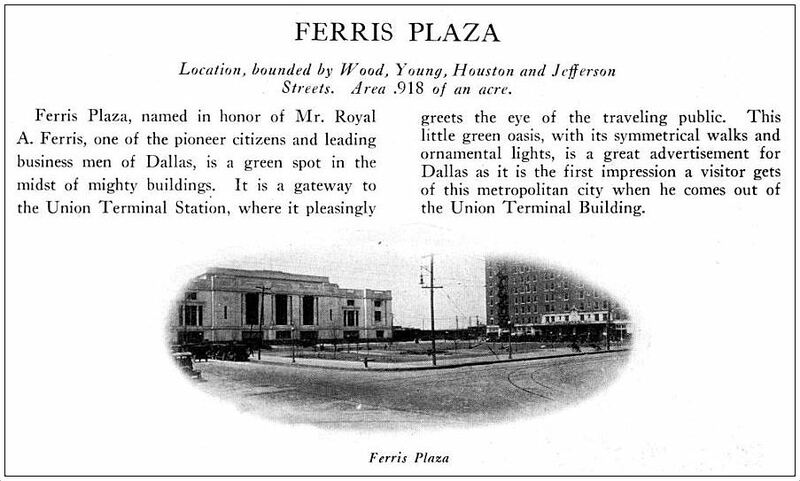 Very early photo and description of Ferris Plaza is from Park and Playground System: Report of the Park Board of the City of Dallas, 1921-1923, via the Portal to Texas History, here. 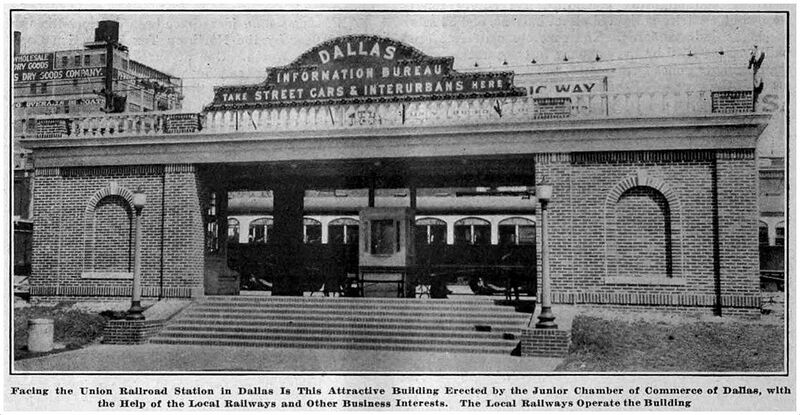 Photograph of Union Station from the Texas/Dallas History and Archives Division of the Dallas Public Library. 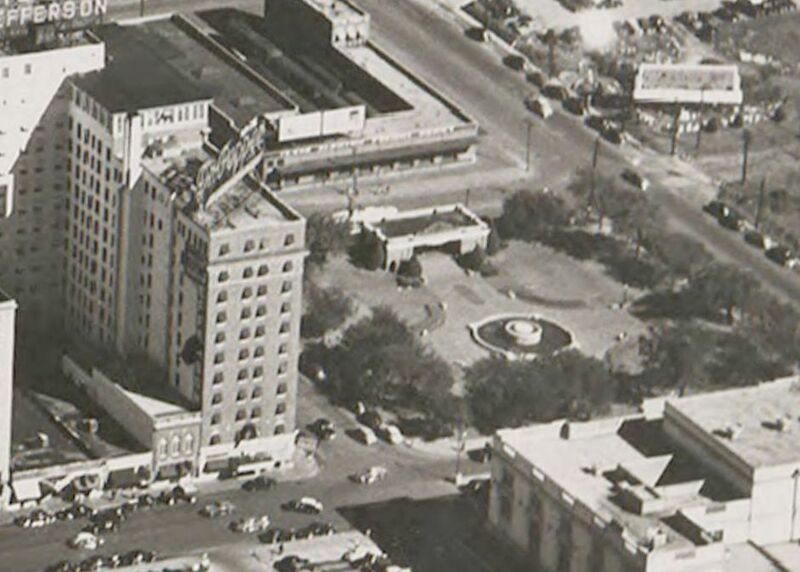 Aerial photo showing Ferris Plaza is from a larger view of downtown by Lloyd M. Long (the original of which is in the Edwin J. Foscue Map Library collection of the Central University Libraries, Southern Methodist University, and which can be viewed here). To read about the Ferris Park restoration project, see here. For a few interesting and weird tidbits about the block that eventually became Ferris Plaza (including the fact that it was thought to be haunted and that it was once the site of a brothel), check out this page on Jim Wheat’s fantastic site. Love all of this. Thanks a million for your work and information. Great!!! Thank you, Jeanette! Thanks for reading! There’s another “comfort station” under the sidewalk on Main Street at the old Municipal Building. Wonder how much of it is still intact there. Yeah, I’ve heard about that/those. Does anyone do an underground tour of Dallas? That would be COOL. I’ve led a few underground tours, but never under the Municipal Building. There are some interesting tunnels and basements in the city. 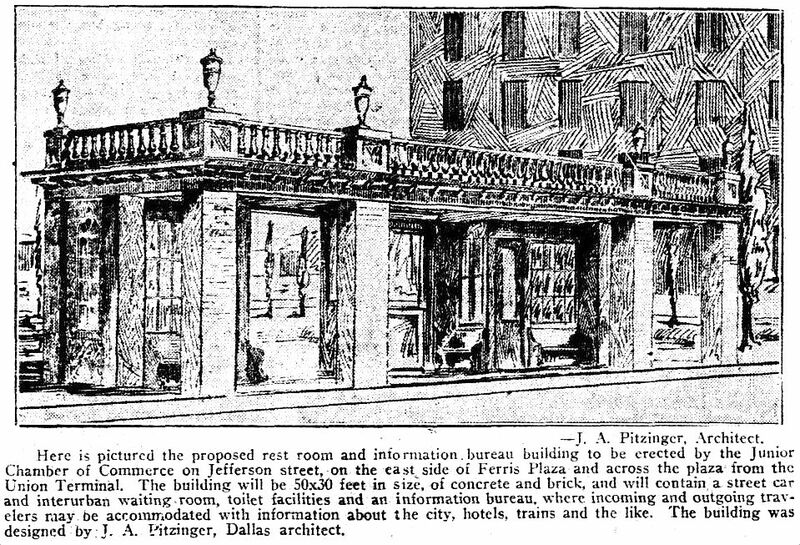 What seems like a fabled “Atlantis” under the Santa Fe Building would be fantastic to see. Have you heard that the Old Red Courthouse and old jail across the street had a tunnel connecting them?